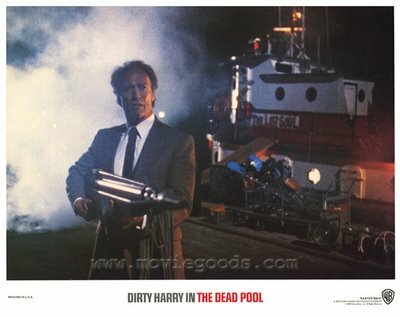 In this film, Dirty Harry does not have any witty come backs - no iconic prose - or even a squint in his eye that makes him look as menacing as he is. NOT! What are you listening to me for you loon? Go ahead and make the day of Director: Buddy Van Horn; and Actors: Clint Eastwood, Liam Neeson, Jim Carrey, and Patricia Clarkson. But only for the year 1988, and for 92 minutes. I am afraid to say that Police Inspector Harry Callahan (Clint Eastwood), has a lot on his plate at the moment. For a start, he is thrust into the media spotlight due to his recent capture and testimony against crime king-pin, Lou Janero - which causes him a lot of personal problems in the process. Then, he is forced to get a new partner for his own safety, Al Quan – which he is not too happy about. Plus, on top of that, he is currently investigating the death of rock singer, Johnny Squares (Jim Carrey), who snuffed it after making a rock-video. 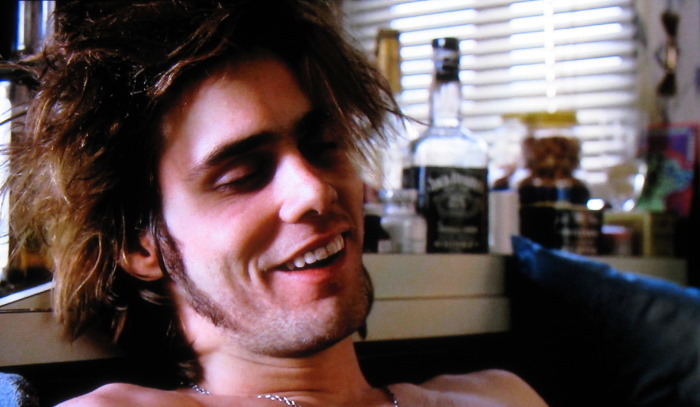 Granted, at first glace, whilst examining Johnny's sprawled out body in his trailer, it does appear to Harry that he died of a heroin overdose. However, sometime later, when the producer of Johnny’s music video is killed in downtown, Chinatown, Harry discovers that the producer and Johnny are both apart of a ‘dead pool’ game - in which participants try to predict celebrity deaths in prose. And do you know what is even more troubling about all of this? The director of Johnny’s film, Peter Swan (Liam Neeson), has both Johnny and the producers names on his 'death list'. Worst still, so is Harry's name too. So what do you think Harry does next, huh? Confront Swan? Yes - he does that - not that it does him any good. But what about that female reporter who fancy's the pants of Harry then? Samantha Walker (Patricia Clarkson)? Maybe she can help him investigate the media side of this 'Dead Pool' game? Err - no - not really - although she does inadvertently aide Harry with his problems with Lou Janero - thank God. Still, this is Harry, right? He does not need any help in capturing a culprit, does he. Because after two more killing’s associated to Swan's list are carried out, plus an attempt is made on Harry's life from a deranged fan of Swan’s, Harry is able to track down the man in question. Well, that is why what next transpires is a right 'make my day' scenario all in all. As partners avoid bangs, reporters hears clangs, criminals duck gangs, and Harry end this adventure with one major twang. Now before I give you my 411 on 'The Dead Pool', please allow me to splurge some film facts first. (1) The Gun's and Roses song used in this film 'Welcome to the Jungle', was used as a non-original score. (2) The remote controlled car used in the infamous 'chase scenes', was a modified miniature 1963 Chevrolet Corvette. 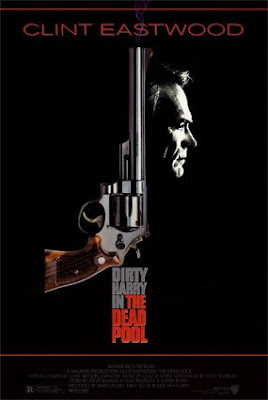 (3) This film was made despite some protests made by certain factions of San Francisco public, who did not like 'Dirty Harry' representing their city. 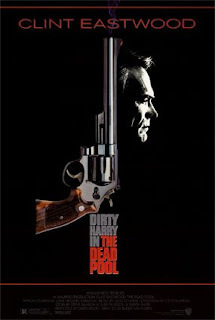 (5) The 'body count' in this film was a lot less then the other 'Dirty Harry' films - 14 - at Clint's bequest. (6) This was the only 'Harry' film not to have Albert Popwell in it - the 'make my day' bad-guy. (7) The set of the Molly Fisher murder was the same one Clint used in his directorial debut, 'Play Misty For Me'. (8) The dead film critique 'Molly Fisher', was based on the film critique who criticized the first Dirty Harry movie, Pauline Kael. (9) Quite a few members of the band 'Gun's and Roses' made cameos in this film. Slash was the person who shot the harpoon gun through the window. And (10) This was the shortest of the 'Dirty Harry' films. OK, so now that my brain is slightly less loose - 'The Dead Pool' - what can I say about this film? Err - I suppose I can start off my stating that it was the last of the ‘Dirty Harry’ film series, and in some way an odd note to end it on. Well, personally speaking of course, there was no grand finale – there was no major revelation – there wasn't even a climax which would end all climaxes. Instead, what was presented was a simple eighties story of fame and the trappings of fame - as well as a franchise that ended with a ‘thwang’ instead of a ‘BOOOM!’. However, maybe my stance on this matter is something to do with what Clint said some time after this film was made? Because he did state that he made a couple of ‘Dirty Harry’ films too many. Or then again, maybe it’s to do with expectations? Well, come on, let’s face it - when we know that a franchise is coming to an end, we always expect the ending to be something of gargantuan proportions that would exceed what has come before it! Heck, ‘The Dead Pool’ was most probably Clint’s idea of defying audience expectations - and just presented a good solid story with no fan fare or defining closure! That is Clint’s style, right? Understated, just like the man with no name? Still, overall, this film isn't that bad a movie – not brilliant – just not bad, and well worth the watch if just to see Clint with a harpoon gun, TWANG! Here, check out this homage to 'The Dead Pool', and please wait for the fanfare, ha! Not that is what I would call an odd note, right?